The Kensington Universal Tablet Charge & Sync Cabinet features a compact cubic design that won't take up too much desk space. It safeguards your valuable devices behind its locking door, which is easily opened with its included key, opens out and then slides into the unit to remain completely concealed and out of the way. The Kensington Charge & Sync Cabinet has ample internal space, allowing you to store, charge and sync up to 10 tablets/eReaders, placing them securely on individual internal shelves, and connecting them into one of the 10 available USB ports located on the front of the unit. Device specific charge & sync cables for iPads, Android tablets, Amazon Kindle devices, and others. The Charge & Sync cabinet features a clever cable management solution, allowing you to keep cables out of the way by feeding them into notched recesses in each of the 10 shelves near both the cabinet and device connection points. The cabinet also provides ample storage for tablets in rugged cases, and the shelves can be removed and re-positioned as needed. If your cases are too large to fit among the standard shelf placement, remove the shelves to store your devices in an upright position. With a multi-point locking system including 2 internally concealed locking mechanisms and a main key-accessed lock, you can trust that your valuable devices will remain safe. The cabinet has side handles for easy lifting. It fits comfortably on an AV cart for ease of mobility, compatible to a 16" width by 13.7" depth. The cabinet can be additionally secured to a post with a compatible Kensington security locking cable, or by optional tabletop mounting. It has a fan for controlled cooling to ensure your devices wont overheat, and notifies you of the charge and sync status of devices in each of its 10 positions via external lights. Comfortably stack 3 Kensington Charge & Sync Cabinets to expand your storage, charge and sync capacity to up to 30 devices. Comfortable store, charge, sync, and secure up to 10 tablets or eReaders with the Kensington Universal Tablet Charge and Sync Cabinet. With ample internal storage, clever cable management, a three-point locking system, and Kensington security locking cable compatibility, this charge & sync cabinet will efficiently secure your valuable tablet and eReader devices. Plus, its cooling mechanism and external status-indicating lights enable optimal charging of multiple devices simultaneously. 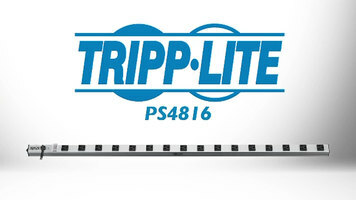 Tripp Lite's PS4816 Power Strip is reliable and cost effective, perfect for installations and building in commercial settings. The 48" strip comes with 16 outlets and an extra long 15 foot cord. For more information on the PS4816, check out the video. Maximize back-of-house storage space with the Cambro Camshelving® high density track system! Designed for space-efficiency and overall convenience, this system is perfect for storing everything from bulk beverages and disposables to countertop equipment and frozen ingredients.